While fresh mangoes are truly mouthwatering, their dried counterparts are also quite irresistible. What’s more, they’re not as messy to eat. Kids won’t even think about candy if they’re able to snack on dehydrated mangoes. Unfortunately, store-bought dried mangoes contain sulfur dioxide, which isn’t really the safest of food preservatives. Still, there’s a way to enjoy a healthy, additive-free treat—and it’s by dehydrating mangoes yourself. Despite being an ancient technique, sun-drying is still a good option. However, it’s highly dependent on both temperature and humidity. If you live somewhere that has a hot, dry climate, this way of making dried fruit could very well be perfect. It’ll also be your cheapest option of accomplishing the task. On the other hand, if you’re in a region that’s mostly cool and humid, you’ll have to rely on other means of drying. The first step in sun-drying is to get good-quality mangoes (those without bruises and aren’t too ripe) and wash them thoroughly. Peel the mangoes and cut them into thin strips (roughly a sixth of an inch). If you’re having a hard time cutting around the pit, you could use a mango slicer. Carefully arrange the slices on a cookie sheet lined with parchment paper. The slices shouldn’t overlap in any way. Cover the entire cookie sheet with a cheesecloth. This is a simple yet effective means of keeping bugs away from your mangoes. Now, place the sheet somewhere that gets a lot sun. Some even put theirs on the roof during a hot day. Flip the slices daily to ensure that they’re evenly dried. Also, don’t forget to store them indoors at night. The drying process will take several weeks, depending on a number of factors. Still, don’t forget to check for doneness every day. Using an oven to make dehydrated mangoes is easier and faster compared to sun-drying. You won’t have to worry about thickness—you’ll even have the option to make dried chunks. The entire process can be done within a day, with the thick pieces only requiring around 12 hours of drying time. The downside though lies in the added expense of running the kitchen appliance for several hours. Start by choosing ripe, unbruised mangoes. Wash them before proceeding to remove the skin and pit. At this point, you may preheat your oven. Setting it to the lowest setting should be enough (not more than 180 degrees Fahrenheit). Slice the mangoes into bite-sized pieces. Again, there’s no need to be very specific with the thickness, but keep in mind that thicker portions will take longer to dry. Arrange the pieces on a wire rack. Place the rack on a baking sheet covered with parchment paper. Put the mangoes in the oven. Flip the slices or chunks every half an hour for even drying. Thin slices shouldn’t take more than three hours of drying in the oven. Chunks, on the other hand, could require up to 12 hours. To some people, there is no better way of dehydrating mangoes than by using their favorite dehydrator. Well, it can be said that dehydrators are superior to ovens in both convenience and efficiency. For one, you won’t have to toss the slices every so often. Aside from that, being smaller and simpler devices, dehydrators don’t use as much resources as a conventional oven. Once again, you’ll have to start by selecting good-quality mangoes and washing them afterward. Peel the mangoes then remove their skin and pit. Make slices that are around a quarter of an inch thick. You could opt for thicker pieces but, of course, they’ll take longer to dry. 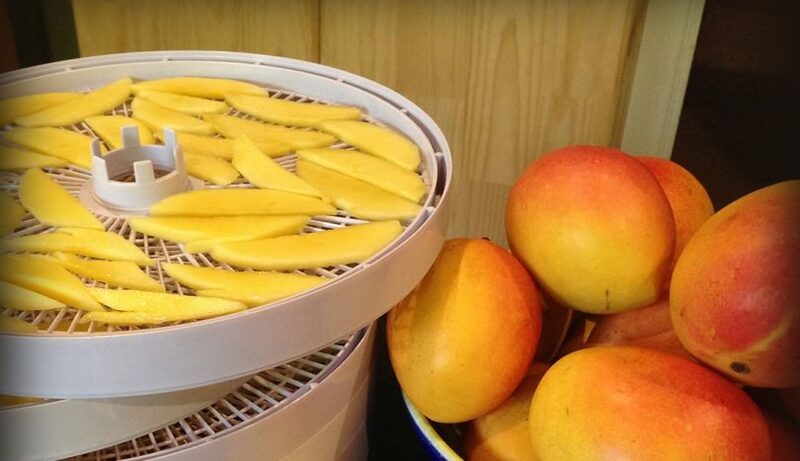 Put the mangoes on your dehydrator’s tray. Arrange them in a way that prevents them from overlapping. Use a baking sheet if necessary (this depends on the type of dehydrator you have at home). For ¼-inch-thick slices, you will have to set the temperature to 135 Fahrenheit. The entire drying process should take around 10 to 12 hours. Before storing your dried mango slices or chunks, check whether they have as little moisture as possible. To do this, just put a few pieces in a Ziploc bag. Close the bag and wait a couple of minutes. If moisture didn’t form inside the bag, the mangoes are finally ready for storage. On the other hand, if moisture did form, you should continue drying them through your chosen method. Dried mangoes can be stored in airtight jars or Ziploc bags. Keep them in a pantry or cupboard, and away from direct sunlight. If you’ve followed the steps properly (especially in checking for quality and minimizing moisture), your fruity treat should stay good for up to six months. That’s amazing since you didn’t even use additives or preservatives. You didn’t even dip them in citric acid (a common step for preventing oxidation). Given that commercially prepared dried fruit contains preservatives and other unwanted ingredients, it’s definitely a good thing that you can dehydrate mangoes at home. And it doesn’t take much time and effort, regardless of which method you choose. You don’t necessarily have to invest in specialized equipment to get the job done either, although there’s always the option to do so. After all, dehydrators aren’t that expensive anymore. Once you’ve familiarized yourself with the basics of dehydrating mangoes, you could mix things up a bit by making dried treats from the puree. This allows making treats with a richer flavor. There is also the option of using citric acid or lemon juice if you want the fruit to retain its vibrant yellow color even after drying. Dipping it in the solution for just a couple of minutes should be more than enough to prevent the browning that comes with drying. Well, regardless of what you’d end up trying, know that in drying fruit, trying new things is often rewarding.